Water, Alcohol Denatured (40%), Butylene Glycol, PPG 5 Ceteth 20, C12 15 Alkyl Lactate, Cetyl Lactate, Cocamidopropyl PG-Dimonium Chloride Phosphate, PEG/PPG 20/6 Dimethicone, Benzalkonium Chloride, Sodium Citrate, Disodium EDTA, Sodium Hydroxide, Fragrance. 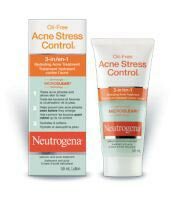 From experience i have found that Neutrogena products help clear my skin up but never fully cure my acne breakouts. This cleanser helped my breakouts at bay but i still continued to have white heads and blackheads on my face. I wish that is had less fragrance because occasionally it would dry out my skin. I am not going to re-purchase this product but it might work for someone with extremely light acne who only gets the occasional breakout. -Pleasant smell -Not too thick, easy to apply -Relatively affordable -Wasn't always effective in clearing up acne Just an okay product, sometimes worked for clearing up acne, other times it didn't work. -Moisturize very well -Not greasy at all -Very good smell -Makes skin less oily - Salicylic acid None. I love this product. I have a very sensitive skin so I can't use anything I want, but I never had any problems with this product.